Developing Research Writing is designed to encourage, inspire and improve the advisory practice of providing writing feedback. 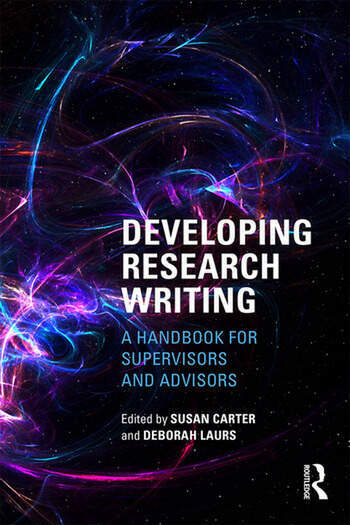 This book provides insights and advice that supervisors can use to advance their support of their research students’ writing and, at the same time, survive increasing supervisory demands. writing feedback as nudging through identity transition. The parts cohere into a go-to handbook for developing the supervision process. Drawing on research, literature and experience, Developing Research Writing offers well-theorized, yet practical and grounded advice conducive to good practices. Susan Carter is Senior Lecturer in the Centre for Learning and Research in Higher Education (CLeaR), University of Auckland, New Zealand. Deborah Laurs is Senior Learning Advisor in Student Learning Te Taiako, Victoria University of Wellington, New Zealand.